Flying cars are a fun gimmick, but they're also horribly impractical (and kind of silly looking). Still, that hasn't stopped Terrafugia from ploughing ahead with its TF-X design, which has just been updated with a slick new exterior. To our eyes, the US-based company's updated car-plane's styling would be better suited to a boat, but it's definitely an improvement over previous models. Currently, the four-set hybrid's new design only exists as a computer animation and a one-tenth scale model, which will soon be tested in a wind tunnel. The model is currently on display in Oshkosh, Wisconsin, at the EAA AirVenture aviation convention. In a statement, Terrafugia said: "The model will be tested at the MIT Wright Brothers wind tunnel, the same tunnel that was used to test models of Terrafugia's Transition. "The wind tunnel test model will be used to measure drag, lift and thrust forces while simulating hovering flight, transitioning to forward flight and full forward flight." Terrafugia has previously projected that its first Transition models would be delivered in 2015 or 2016, with a price of US$279,000. But after several delays, flying car enthusiasts will have a couple of years left to wait, along with increased costs. 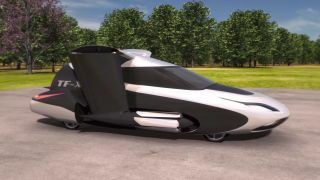 While we have our doubts that there'll be many ordinary suburban households – like the one in the video below – with space in the garage (or cash in the bank) for a flying car, we do like the idea of taking to the skies without worrying about the etiquette of seat reclining, or the hygiene of fellow passengers. Terrafugia's not the only company in the flying car game. Aeromobil's model is expected to go on sale in 2017.